We introduced Japan’s first central kitchen system in September, 1962 and now we are operating in two locations in Fukuoka and Tokyo. As a back kitchen of the Royal Group, we supply variety of products with a stable quality to improve store operation efficiency and strengthen quality control. Based on the philosophy “chef’s hand-made heart-warming taste”, we make products without compromising the authentic taste by careful ingredient selection and dedicated cooking method. 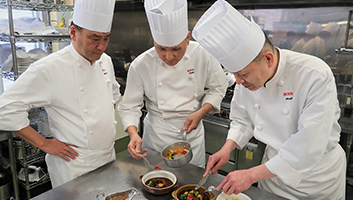 In the Fukuoka factory, we produce industrial products and ready-made entree, bakery is also available to produce sweets, breads and sweet potatoes dessert. Small scale kettle (8 kettles with a 600 liters capability, 6 kettles with a 400 liters capacity) are used to prepare small-lot-wide-variety products to meet the needs of varies business categories in our group. In May, 2000, Fukuoka factory obtained the ISO9001 certification and in June, 2011, our sweet potato dessert production line became ISO22000 certified. 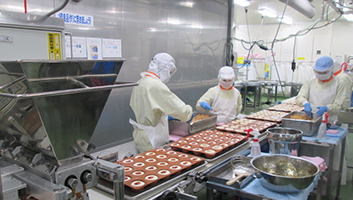 The Tokyo Factory manufactures industrial products and frozen cakes breads and dressings. The large scale equipment (5 kettles with a 1.5 tons capacity, 1 kettle with a 5 tons capacity, 4 kettles with a 0.7 tons capacity) facilitates cost-effective mass production. In April 2008, all production lines acquired the ISO 9001 certification. The facility is renewed in September, 2016 with the addition of freezers and auto-stacking system, as well as a separate line for producing individual packaged frozen cakes. In addition, we established a dedicated production line in our Fukuoka factory to prepare Halal products. It is certified by the Japan Islamic Trust and currently HALAL meal box and bento are produced to meet the needs of our group as well as other customers. The Fukuoka bakery also received the halal certification to produce halal breads in January 2016. We continue to pursue high quality and tasty products under the stringent quality control, to meet future demand and market needs.